Minority Member of Parliament (MP) for Builsa South Constituency in the Upper East Region, Dr Clement Apaak, has kept to his promise of investing in education of his people by supporting needy and brilliant pupils, and extending education infrastructure in his constituency. The MP who is perceived to be the ‘Darling Boy’ of the 2020 flag-bearer of the opposition National Democratic Congress (NDC), former President John Dramani Mahama, believes that, the development of every child of school-going age was paramount, hence his resolve even before becoming an MP to make education in his constituency a major priority. And living by his word, the Builsa South legislature last year renovated four (4) classroom blocks including teachers’ quarters. The renovated school blocks are Kunkwak KG classroom- Gbedema, Abaayire KG classroom-Butriensa, Gobsa KG classorrom-Gobsa, Uwasi primary classroom-Uwasi and Uwasi Primary teachers’ quarters also in Uwasi. 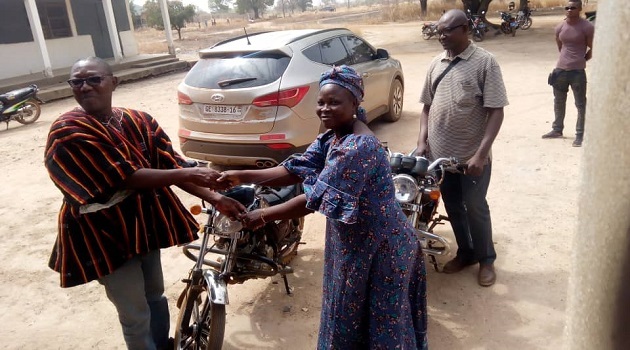 The office of the Ghana Education Service (GES) in his constituency was also not left out as it received its fair share of the MP’s gesture in the form of motorbikes and the maintenance of the office Pick-up vehicle. Speaking to Today in an interview via telephone yesterday in Accra, Dr Apaak said his dream, before joining politics, was to see his people become successful in life through education, hence the renovation of the classroom blocks so as to make teaching and learning more comfortable for both teachers and in his constituency. He reiterated his commitment to boost the human resource base of his constituency through education and good health. “I’m not into politics to enrich myself and family, but to give hope to the hopeless in my constituency and by extension my country,” he said. Our checks also indicated that Dr Apaak last year donated ten (10) Desktop Computers to Fumbisi Junior High School (JHS) in his constituency. A letter in possession of Today, written by management of the school, dated November 27, 2018 thanked the Builsa South MP for his kind gesture. “We thank you so much for the kind gesture. It is, therefore, our hope that these computers will go a long way to enhance the teaching and learning of information, communication and technology in the school,” the letter read in part. Next articleDANIEL ARCILESI’s STRIKES AGAIN AS HE WINS MVP IN GREECE.